I Want to Know what Google and Facebook Know – Sanspoint. As Apple draws a battle line between themselves and Google over privacy, I’ve heard more than a few people in tech circles spout the same refrain about Google’s monetization of our data. “Google’s not selling your individual data,” they say, “they’re aggregating your data and selling that!” That’s not as reassuring as I think they mean it to be. They’re still collecting my data, and they’re still selling ads to target me—they’re just packaging it all up with other people’s data, and selling it in bulk. The advertisers who buy the targeted info can’t identify me individually, but they have a group of people who are similar enough to me for advertising purposes that it’s saleable. That’s, at least, what I understand of how Google’s data collection and ad tracking works. Facebook’s system works in a similar way, but they have a more clever way of identifying the specific things I’m interested in. The problem is, I don’t know the extent of both what they’re collecting on me, and I don’t know the extent of what they’re selling to advertisers. 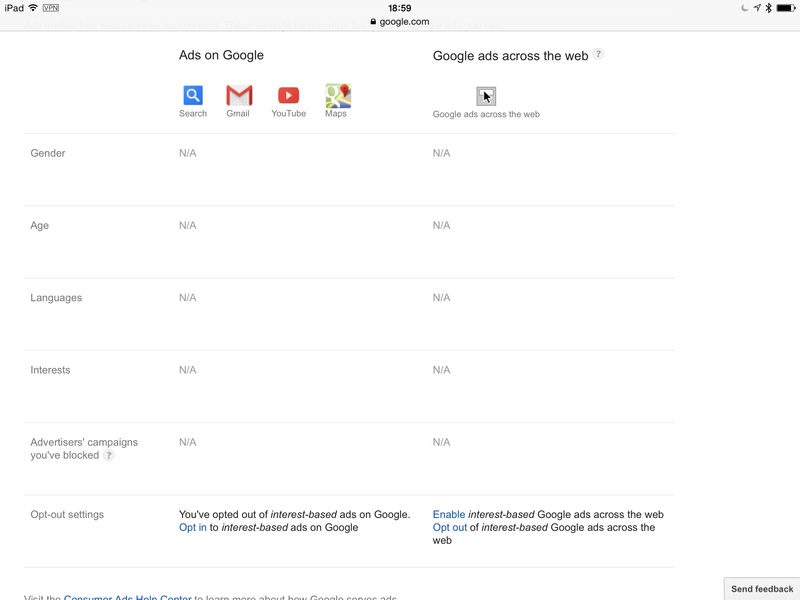 Google’s Ads Settings page lets you see the profile Google has on you, including your gender, age, languages, and “interests.” If you haven’t explicitly provided them, it shows you Google’s algorithmic guess. My page comes up empty, because I thought it smart to opt-out of Google’s interest-based ads. If only I trusted it. At least Google provides something, even if I doubt it’s a complete picture of what they’re packaging and sending. Facebook doesn’t even offer me the courtesy of showing me what it thinks it’s determined about me. I’ve stripped my Facebook profile down to the bare minimum I feel I can get away with and still use the service: my name, my birthdate, my relationship status, and the bands I like. That’s it. Both Google and Facebook, however, track my move online—at least when I’m not using Disconnect. Hell, Facebook even tracks the status updates and messages I choose to not send. They have more data on me than they let on, even after opting-out of everything I can find. I want to see that data. Loathe as I am to use the “if you’re not doing anything wrong, you have nothing to hide” argument that these companies—and the US Government alike—use on us, that’s what I’m reduced to. If I shouldn’t worry about the data I feed to Google, Facebook, and a whole holy host of similar companies and services out there, why not be more transparent about what data is being collected, how, and what they know about me? I want to see a simple, clean, human readable page on every service I feed my personal data to that tells me every last piece of information that they know, everything they sell to advertisers, how, and a way to opt-out. If I can’t opt-out, at least show me a way to delete my account—and my data—should I become spooked. This is fair. This is right. This is my data that I am creating, and I have no way of knowing what is being collected, or how it’s being used, without reading a massive dose of legalese called the Terms of Service. If, as Natasha Lomas claims on TechCrunch, “The online privacy lie is unraveling,” then it is to the benefit of Google, Facebook, et al. to pull back the curtain and reassure us that we, and our data, are not being exploited as much as we’ve feared. That is, unless the truth is even worse than the none-too-comfortable fiction that these companies have created for us. Only one way to find out.